A security agency owned by Solicitor General Jose Calida and his family bagged a whopping P40 million deal to provide security guards and CCTV operators at the Luneta and Paco Park. No less than Calida’s wife, Milagros O. Calida, chair and president of Vigilant Investigative and Security Agency, Inc. (VISAI), signed the contracts with Penelope Diaz Belmonte, executive director of the National Parks Development Committee (NPDC). The NPDC is an agency attached to the Department of Tourism tasked to beautify, preserve and maintain the country’s premier park, the Luneta, and the smaller but historic Paco Park, both in Manila. The website of the Office of the Solicitor General has identified Calida’s wife as Milagros. His official bio on the OSG website also mentioned that he was once the Chairman and president of VISAI, and General Counsel of Philippine Association of Detective and Protective Agency Operators, Inc.
An Atty. Mark Jorel was also listed among the Calidas three children. The young Calida sits as Vice President for Operations and Administration of VISAI since December, 2017, according to LinkedIn. A native of Davao province, Calida was handpicked by President Duterte for the Solgen post. The Solicitor General engineered the ouster of Chief Justice Lourdes Sereno through a quo warranto petition early this month. He also led . government lawyers and Duterte’s allies at Congress in a case buildup against Senator Leila de Lima, who remains in detention. Sereno and De Lima are known critics of President Duterte. Following the ouster of Sereno, one her followers filed a criminal complaint against Calida over the supposedly unconstitutional quo warranto petition, graft for owning a security agency that had contracts with the government and immorality for maintaining extramarital relations with one of his staff. Documents furnished to Politiko showed how the Calida-owned agency entered into multi-million contracts with the NPDC in a period of 18 months. The first agreement, worth P10 million, was signed on June 29, 2017. It covered a period six months from July 1, 2017 to Dec. 31, 2017. The contract said there was a bidding on June 21, 2017, but the documents could not be accessed from the NPDC website. In the agreement, the VISAI was tasked to maintain peace and order in the Luneta Park and the NPDC office on T.M. Kalaw, and the Paco Park on San Marcelino St., Paco, protect the NPDC workers, park visitors as well as installations and properties from theft, vandalism and destruction either by outsiders or by NPDC employees. The first contract is worth P10 million where VISAI will deploy for six months 37 security guards led by one detachment commander and two deputy detachment commanders, and four CCTV operators. The second contract is worth P30 million where Calida’s firm will deploy for one year 55 security guards, one detachment commander, two deputy commanders, and 10 CCTV operators. The agency will also provide canine service and additional security personnel for emergency situations. On December 27, 2017, the NPDC announced a bid for security services for 2018. VISAI submitted a bid of P29,244,670.62, while the other bidder, Maximum Security Services Corporation, P29,664,935.52. The NPDC Bids and Awards Committee passed a resolution on Jan. 28, 2018, declaring VISAI the winning bidder. On Jan. 31, 2018, Milagros Calida and her son, Atty. Mark Jorel Calida, met the NPDC executive director Penelope Belmonte for the signing of the second contract. Is the bidding rig? If yes, file a case against Calida’s wife and the rest. Its that simple, what is the Ombudsman doing, sleeping on the job again. taena itong si bokbok. Kawatan by night. Kaya pala tahimik na. Solicitor General Jose Calida is reportedly slowly building a business empire out of his and his wife’s security agency by snapping up contracts in government offices one by one. A source told Politiko that Vigilant Investigative and Security Agency, Inc. (VISAI), a company chaired by Mrs. Milagros Calida, has taken over as the security provider of the House of Representatives. VISAI’s multimillion-peso contract with the House is on top of the deals it allegedly got to provide security guards and closed circuit television (CCTV) operators at Luneta and Paco Park. Documents obtained by Politiko showed VISAI bagged contracts worth P40 million from the National Parks Development Committee (NPDC) over the past 18 months. Calida assumed office in June 2016. NPDC, an agency attached to the Department of Tourism, is tasked to beautify, preserve and maintain Luneta and the smaller but historic Paco Park, both in Manila. VISAI’s first contract with NPDC, which was worth P10 million, was signed on June 29, 2017. It covered a period six months from July 1, 2017 to Dec. 31, 2017. The second contract, worth P30 million, was bagged by the Calida-owned agency last January. It will always be prone to suspicion... but I’m not sure if there is a law that prohibits this type of transaction when the official is from SG and the govt office is DOT. If its Wanda Teo that owns the Security Agency, thats a clear conflict of interest... but there will always be a suspicion. Lets pass a law that prohibits companies of top officials from bidding, they should just use dummy like normal corrupt politicians do. From guarding parks to offices, a security agency owned by Solicitor General Jose Calida made a killing snapping up contracts from various government agencies since he started his term in June 2016. 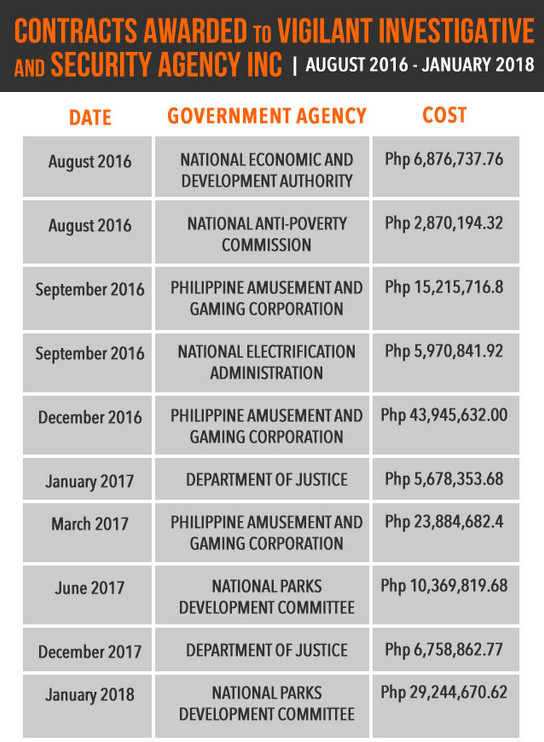 Public documents showed Vigilant Investigative and Security Agency Inc. (VISAI) bagged two contracts worth a total of P9.8 million from the National Anti-Poverty Commission (NAPC) and the National Economic and Development Authority (NEDA) on the same month, August 2016. The NAPC contract, worth P2.9 million, required VISAI to provide seven security personnel for the secretariat. Meanwhile, the NEDA contract was renewable for two more years, with the agency paying VISAI P6.9 million for the initial year of service. VISAI’s contracts with NEDA and NAPC were on top of the P40 million worth of deals it bagged from the National Parks Development Corporation (NPDC) to secure Luneta and Paco Park. The Calida-owned security agency is also tasked to secure the vast Batasang Pambansa, where the House of Representatives stands. In a statement, Calida denied any conflict of interest in VISAI’s contracts, saying these went through public bidding and he already resigned as the company’s president and chairman before assuming office. MANILA, Philippines – Solicitor General Jose Calida's family-owned security firm has bagged P150.815 million in contracts from 6 government agencies, including the Department of Justice (DOJ), since he became the Philippine government's top lawyer. Calida's company, Vigilant Investigative and Security Agency Incorporated, won 10 government contracts between August 2016 and January 2018, based on award notices accessed by Rappler. Two of these contracts, worth P12.4 million, were with the DOJ, which prepares the budget of the Office of the Solicitor General (OSG). Vigilant bagged them in 2017. Calida, however, denied any conflict of interest. He said he resigned as chairman and president of Vigilant on May 30, 2016, or before he assumed office at the OSG in July of the same year. Vigilant notified the Securities and Exchange Commission (SEC) on July 14, 2016, that Calida resigned as president and chairperson of the company effective June 30, 2016. The notification said the Solicitor General's wife, Milagros Calida, was its new president and chairperson. Their son, lawyer Josef Calida, was its vice president and corporate secretary. Their daughter Michelle was its treasurer. However, SEC documents also show that Calida still owned 60% of shares in the company as of September 29, 2016. This was at least two months after he took his oath as Solicitor General in July 2016. Vigilant has no shareholders other than Calida and his immediate family. Based on their General Information Sheet (GIS) at the SEC as of September 29, 2016, Calida owns 60% of the company's shares, Milagros has 10%, and their 3 children Josef, Michelle, and Mark Jorel each have 10%. The company's GIS on September 29, 2016, was its last publicly available GIS. The GIS is a document that a company is required to submit to the SEC every year to reflect the firm's structure and ownership. Calida, in his latest statement sent to the media, does not categorically deny that he still has shares in Vigilant. A complaint recently filed with the Office of the Ombudsman alleged that Vigilant's contracts violate Republic Act (RA) 6713, or the Code of Conduct and Ethical Standards for Public Officials and Employees. Calida said the contracts were in line with RA 6713. Two legal experts told Rappler that Calida's case can be seen in the light of the recent indictment of Davao del Norte 2nd District Representative Antonio Floirendo Jr. The Ombudsman charged Floirendo for violating not RA 6713, but RA 3019 or the Anti-Graft Law. This was because Floirendo allegedly had financial interests in the government contract of a family company. In its contracts with government, Vigilant was tasked to provide security guards and other security requirements for the government agencies. Details of Vigilant's contracts can be found in the Philippine Government Electronic Procurement System (Philgeps), a public database that should contain all details of a bidded out project. Award notices posted on Philgeps show that Vigilant has won 10 awards from 6 government agencies since August 2016. Of these 10 award notices, Vigilant won 9 after Calida became Solicitor General. One of Vigilant's contracts was also posted on the website of the National Anti-Poverty Commission (NAPC), bringing to 10 the number of contracts won by Vigilant after Calida took the helm of the OSG. From these government contracts, Vigilant earned P150.815 million in two years. Vigilant's biggest contracts were those from Pagcor: P15 million in September 2016, P43.9 million in December 2016, and P23 million in March 2017. The contracts involve security services for Pagcor's corporate offices and facilities, the Casino Filipino-Pavilion, and its satellite operations group. The contracts all last for 3 years. MANILA, Philippines – Opposition lawmakers said on Monday, May 28, that the security agency of Solicitor Jose Calida also has a contract with the House of Representatives, in addition to the 10 it bagged from different government agencies. A sourced photo taken on Monday showed a security guard at the South Wing of the Batasan building wearing a patch of Vigilant Investigative and Security Agency Incorporated on his uniform. Vigilant is Calida’s family-owned security company. While he resigned as chairman and president in June 2016, he still owns 60% of company shares, according to Securities and Exchange Commission (SEC) papers as of September 2016. The remaining 40% is evenly shared among his wife Milagros and their three children. The contract with the lower house is not included in 10 contracts worth P150.815 million that Calida’s Vigilant bagged since he was appointed Solicitor General by President Rodrigo Duterte in July 2016. The House contract would bring to 7 the number of government agencies that awarded security projects to Vigilant. The 10 contracts that Rappler ealier reported are those publicly available on the Philippine Government Electronic Procurement System (Philgeps), and the website of the National Anti-Poverty Commission or NAPC. Akbayan Representative Tom Villarin claimed in a statement to media on Monday that Calida has a contract with the House of Representatives. Magdalo Partylist Representative Gary Alejano said on Twitter that Vigilant came in at the start of the 17th Congress in July 2016. “Dito sa House of Rep ay Vigilant Investigative and Security Agency din. The long time sec agency was kicked out at the start of 17th Congress. Lakas mo pre!” Alejano said. A contract between the House of Representatives and Vigilant is not available on either Philgeps or the lower house’s transparency seal microsite. Philgeps is a public database that should contain all details of projects bidded out by government. “It is clear as day that conflict of interest is manifest as Solgen Calida has clear financial interests in a government contract awarded to his family corporation worth at least P150.815-M as reported, including a contract with the House of Representatives,” Villarin said. Calida refused to answer questions from reporters on Monday when he visited the Senate. “There’s none (conflict of interest), my lawyer will answer that,” he said. Presidential Spokesperson Harry Roque said he saw no conflict of interest if the assets are properly declared by an official. Calida earlier said his resignation as chairman and president of the company made Vigilant's contracts lawful. Senator Francis Pangilinan has called on Calida to resign. A complaint against Calida over Vigilant’s government contracts has been filed by a private citizen with the Office of the Ombudsman. LOL. Tinalo lang ng limang beses kaya humanap ng butas. Kung may laman yang akusasyon kay Calida, kasuhan nyo na. Did he personally intervened? Wala? Anong kaso? Walang Kaso.....Mema lang...Alam mo naman ang mga Dilawan. Kung may kaso, yung Ombudsman nilang Dilawan eh bakit naka-nganga lang? MANILA, Philippines – The House of Representatives awarded two contracts worth P96 million in 2017 to the security firm of Solicitor General Jose Calida, according to the notices of awards accessed by Rappler. A more thorough search on the public database Philippine Government Electronic Procurement System (Philgeps) also showed two additional contracts awarded to Calida’s Vigilant Investigative and Security Agency Incorporated by the Philippine Amusement and Gaming Corporation or Pagcor in 2017. These two contracts were worth a total of P14.3 million. Adding the latest we have found in the government database, the number of Vigilant’s government contracts since after Calida took office July 2016 is now at 14, with a total worth of P261.39 million. Rappler earlier reported that Calida’s security firm Vigilant Investigative and Security Agency Incorporated won 10 government contracts worth P150.815 million starting August 2016, or after Calida became solicitor general. Rappler found the first 10 contracts when it searched for Vigilant on Philgeps. Rappler had to check individual pages of government agencies to find the additional 4. Since the issue of possible conflict of interest broke out, Calida's camp had sent two statements: one addressing the government contracts from NPDC, which were earlier reported, and the latest one on Monday night, May 28, addressing the 10 contracts which were reported by Rappler. 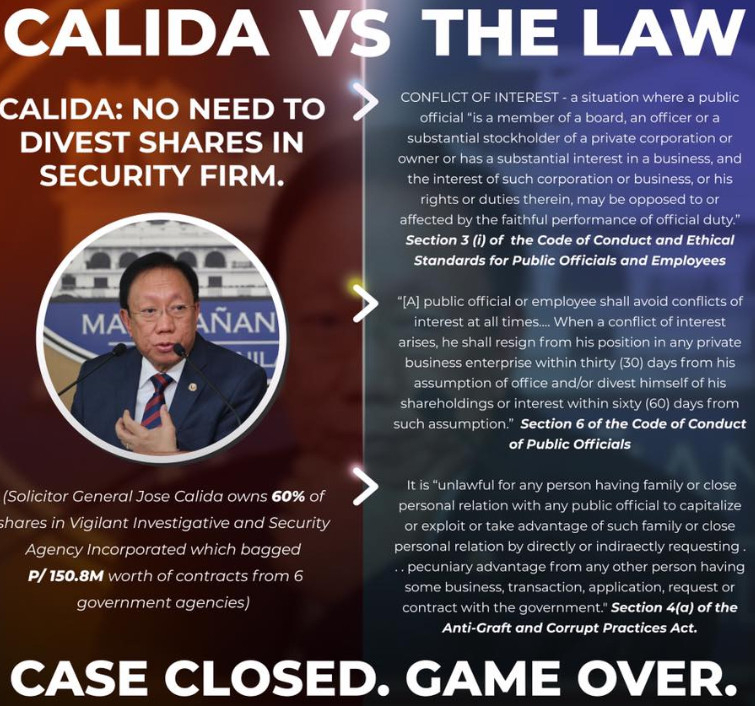 Vigilant, where Calida is a majority shareholder, earned the first security contract with the House of Representatives in January 2017. It was worth P42.45 million, for “private security services” lasting a year. It was won through public bidding, by being the lowest calculated responsive bid. In December 2017, Vigilant won another contract with the lower house, this time worth P53.7 million. It was a one-year contract for “security services for the House of Representatives” for 2018. The December 2017 House contract was signed by Calida’s wife Milagros. Calida had earlier defended that his resignation as chairman and president of Vigilant before he became solicitor general rids the deals of any conflict of interest. Sarap malapit sa palayok. Panay ang salok. After DOTr, DOJ, meron pa kayang next? 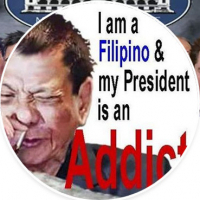 Sana wala na. Sanay kayo dyan dati kaya galit kayo kahit wala namang anomalya. Tingnan mo ang DOH, BILYONES ang winaldas nung nakaraang admin. May MRT pa, tsk tsk. So, may ipopost ka ba tungkol sa nagdaang corruption? Nadale mo....yung mga nakawan sa 4bnoy admin BILYONES talaga...pero tahimik lang sila, kasi nga mga eng0t eh. MANILA, Philippines – Justice Secretary Menardo Guevarra made a slight change of tune on Wednesday, May 30, saying he will now review the Department of Justice (DOJ) contracts awarded in 2017 to the family-owned security firm of Solicitor General Jose Calida. "Nobody has come up with such an allegation, but nonetheless, the DOJ will take a look now that it's brought to the floor already. To satisfy everyone, we'll just take a look," Guevarra said after his confirmation hearing was suspended on Wednesday noon. 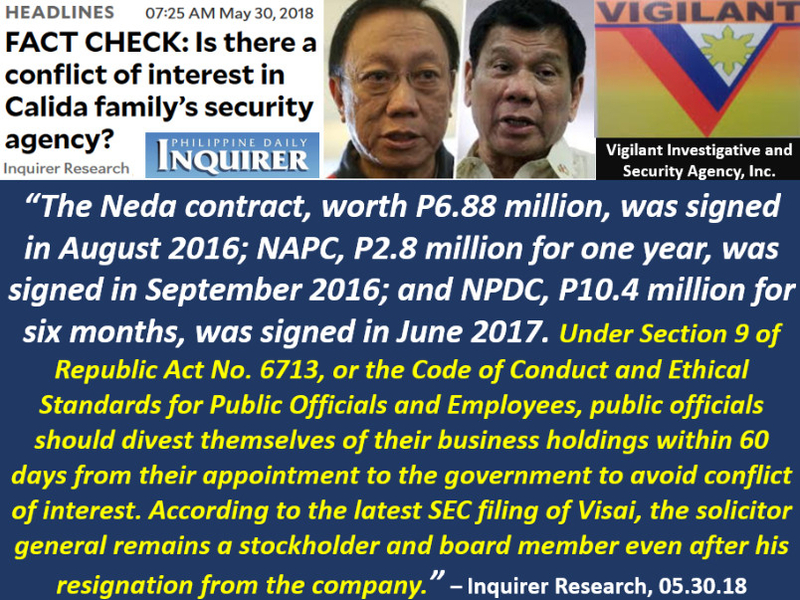 Calida's family-owned security firm Vigilant Investigative and Security Agency Incorporated or Vigilant won two contracts worth 12.4 million in 2017. This was during the time of former justice secretary Vitaliano Aguirre II. Guevarra was at the Senate on Wednesday for his confirmation hearing before the Commission on Appointments (CA). Senator Francis Pangilinan raised the issue of Vigilant's contracts before suspending the hearing so the CA can hold an executive session. Before going off to the session, Pangilinan approached Guevarra and clarified what the latter had meant by his earlier statement that he does not see the need to investigate Vigilant's DOJ contracts. "Kailangan lang may mag-challenge noong validity (Someone just has to challenge the validity)," Guevarra told Pangilinan. When reporters asked Guevarra afterwards if they could proceed with the review without a complaint, the secretary said, "Well, it was already mentioned during the hearing by Senator Pangilinan. Now that it has been brought up, we'll take a look." 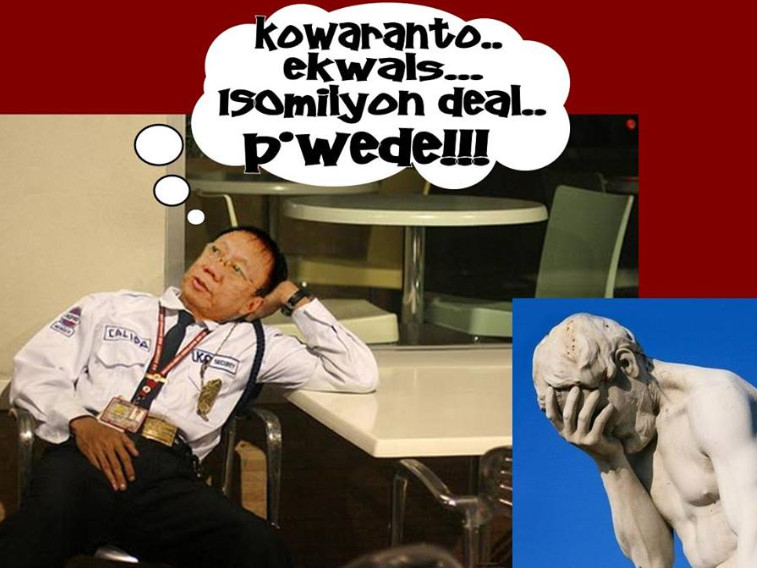 "Now, if there are ethical considerations, well, that's for SolGen Calida to deal with. From our point of view, we are dealing with a legitimate corporation," he said. When asked what his views were on questions on conflict of interest, Guevarra said he doesn't see anything wrong with public officials having shares in private companies. "If you want to invest some money in some corporation, you are not prohibited from doing that. Ang bawal, 'yung ikaw mismo 'yung nagpapatakbo ng kumpanya na 'yun, actively involved ka, in the operations, in the management of a certain corporation, kasi public official ka na," Guevarra said. Calida resigned as president and chairman of the company in June 2016, right before he took office as Solicitor General, but he still holds 60% of company shares. His wife Milagros is now the chairman of the company, with their 3 children as officers. No other person aside from the Calida family has a share or is an officer of the company.